Even though it SNOWED here in Utah this weekend... I am still hoping/wishing/praying for some nice SPRING weather! So to get me in the mood... 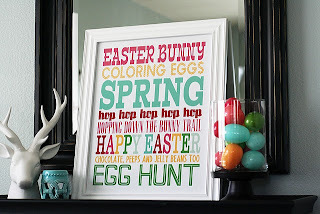 I printed this Spring Subway Art out this weekend, put it in my shabby white frame, added some greenery around it, and I now have a little corner of spring in my house! Go here to download & print.